Since Aug. 25, 2017, more than 700,000 people from Myanmar have fled to Bangladesh because of extreme violence in northern Rakhine state, on the country’s western Bay of Bengal coast. Most of the refugees identify as Rohingya, a Muslim minority ethnic group, in predominantly Buddhist Myanmar. Flooding into camps near the town of Cox’s Bazar, they joined more than 200,000 people who fled to Bangladesh years earlier. About 55 percent of the refugees are children. Aid agencies are struggling to adequately serve 1.3 million people who need assistance, including those in local communities. Many refugees brought little with them and are dependent on humanitarian aid for shelter, food, clothing, and healthcare. During the monsoon season from April to November, they faced floods and landslides while living in flimsy shelters, which made poor conditions even worse. 1948: After Burma’s independence from British rule, a Muslim rebellion erupts in Rakhine state, with people demanding equal rights and an autonomous area. The rebellion is eventually defeated. 1962: Military rule begins in Burma. 1977 to 1978: Some 200,000 ethnic Muslims identifying as Rohingya flee to refugee camps in Bangladesh. 1982: A new citizenship law identifies 135 national ethnic groups, excluding the Rohingya — effectively rendering them stateless. 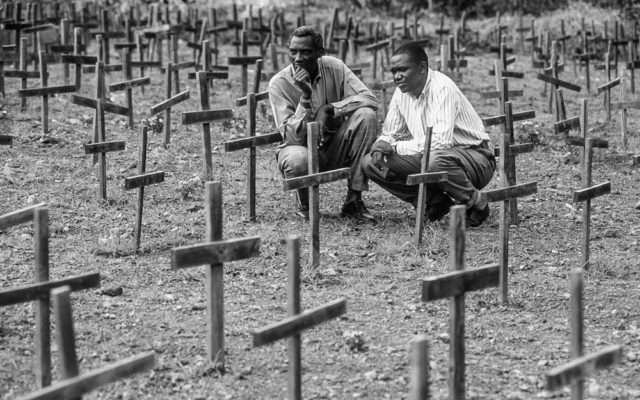 1989 to 1991: A military crackdown follows a popular uprising. Burma is renamed Myanmar. An additional 250,000 refugees flee to Bangladesh. 1992: The Myanmar and Bangladesh governments agree to repatriate refugees. Hundreds of thousands of people return to Myanmar over several years. 2003: Two of 20 refugee camps remain in Bangladesh. U.N. studies show widespread malnutrition in the camps. 2012: Religious violence flares in Rakhine, leaving many people homeless. More than 100,000 people flee to Malaysia. 2014: In Myanmar’s first census in 30 years, the Rohingya are still not included as an ethnic group. 2016: A military crackdown follows an attack on a border post in which police offers were killed. During the crackdown, about 87,000 people fled to Bangladesh. August: Violence increases in Rakhine state among ethnic groups and Myanmar military forces, triggering a massive exodus of people to Bangladesh. September: The U.N. refugee agency declares the Myanmar refugee crisis to be a major emergency and scales up its response. 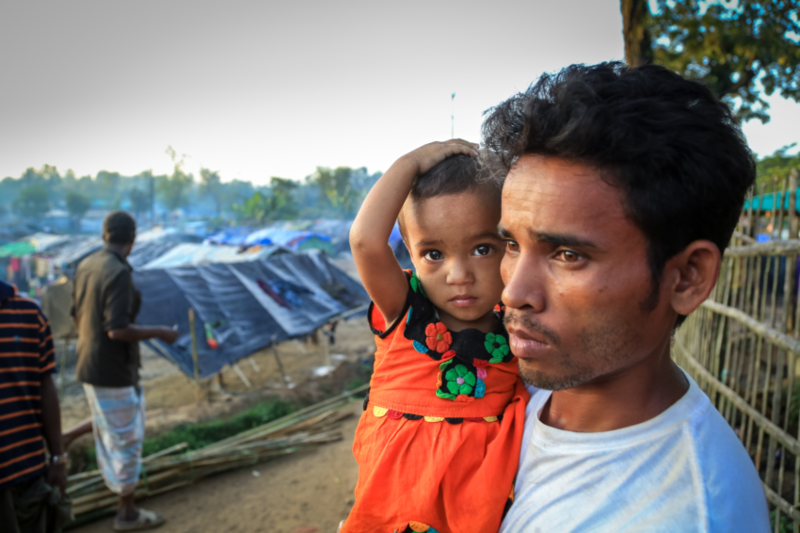 October: More than 600,000 refugees have arrived in Bangladesh. November: Myanmar and Bangladesh agree to start repatriating refugees within the next two months. January: The agreed start date for repatriation passes without action. April: U.N. Security Council envoys visit Myanmar and Bangladesh to observe needs and conditions. April through November: Monsoon and cyclone seasons increase hazards for refugees living in stick-and-bamboo tents in camps. Mid-November: Repatriation was supposed to begin, according to a working group of Bangladesh and Myanmar government representatives. However, it has again been delayed. January: Increased violence in Myanmar’s Rakhine state led to an additional 4,500 people being displaced since December 2018, casting doubt on the feasibility of refugees returning anytime soon. 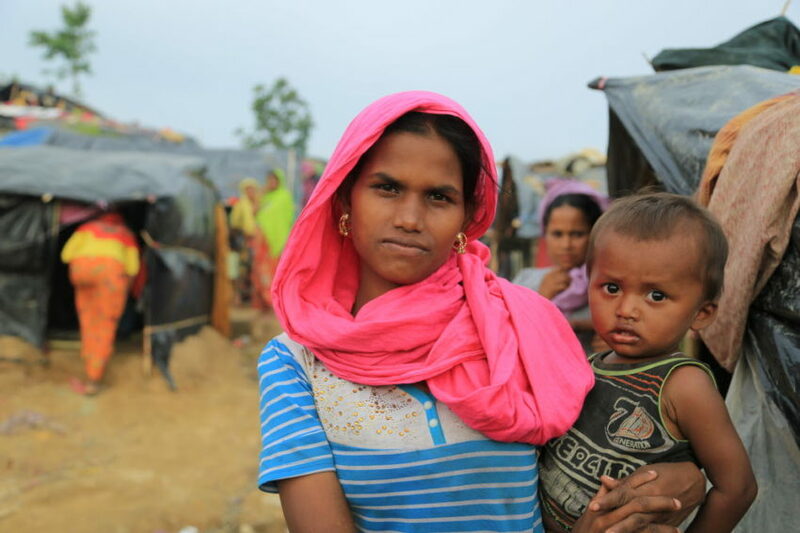 Explore frequently asked questions about the Rohingya people, why they are fleeing Myanmar, and learn how you can help Myanmar refugees in Bangladesh. How can I help refugees from Myanmar? What are the refugees’ living conditions? How are children affected by the refugee crisis? 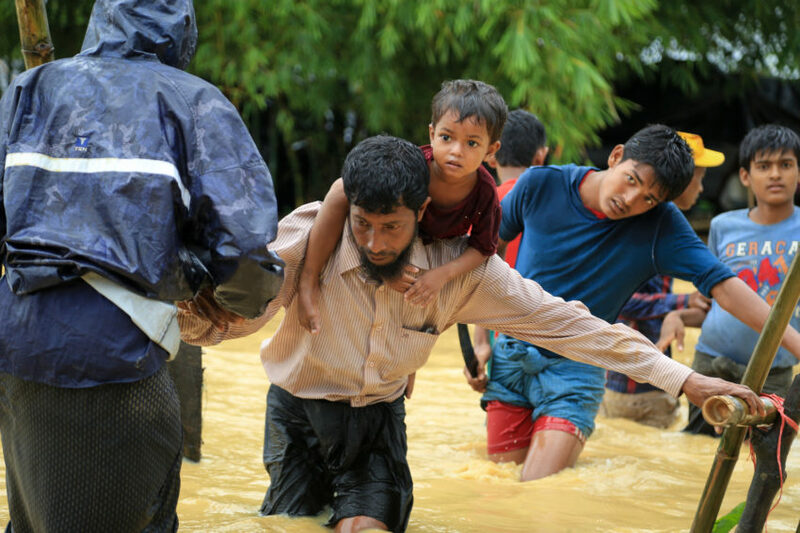 How is World Vision responding to humanitarian needs in Myanmar and Bangladesh? Of nearly 900,000 Myanmar refugees in Bangladesh camps and settlements, about 700,000 have arrived since August 2017. About 1.3 million people — both refugees and local community members — need humanitarian aid because of the crisis. The world’s largest, most densely populated refugee camp houses Myanmar refugees in the Kutupalong settlement near Cox’s Bazar, Bangladesh. From April through November, heavy monsoon rains made life perilous for refugees in overcrowded camps in Bangladesh. Myanmar and Bangladesh governments are negotiating terms for repatriation to Myanmar. In the meantime, children and their families are living in unhealthy, dangerous conditions with limited access to basic services. The Rohingya people belong to a Muslim ethnic minority group of about 1 million people in Myanmar, which has a total population of 52 million. They live in the country’s northern Rakhine state that borders Bangladesh and India. The Rohingya were not among the 135 officially recognized ethnic groups included in Myanmar’s 2014 census. Essentially stateless, the Rohingya consider themselves under threat and without legal recourse. Receiving humanitarian assistance is a life or death matter for Myanmar refugees, 55 percent of whom are children. Pray for mothers, fathers, and children who struggle to survive as refugees. Give to World Vision’s refugee crisis fund to help provide for their needs. After fleeing violence in Myanmar, refugees have battled to survive seasonal monsoon rains and the continuing threat of cyclones. They’ve faced flooding, landslides, collapsed or damaged shelters, contaminated water overflowing latrines, and disease. Refugees are suffering from psychosocial conditions and physical illnesses that spread easily in overcrowded, unhygienic camps. With such a high concentration of people, any disease outbreak has the potential to kill thousands. Diarrhea, acute jaundice syndrome, and respiratory infections are common in both adults and children. Acute watery diarrhea is especially dangerous in combination with malnutrition, which is rampant among the refugee population. 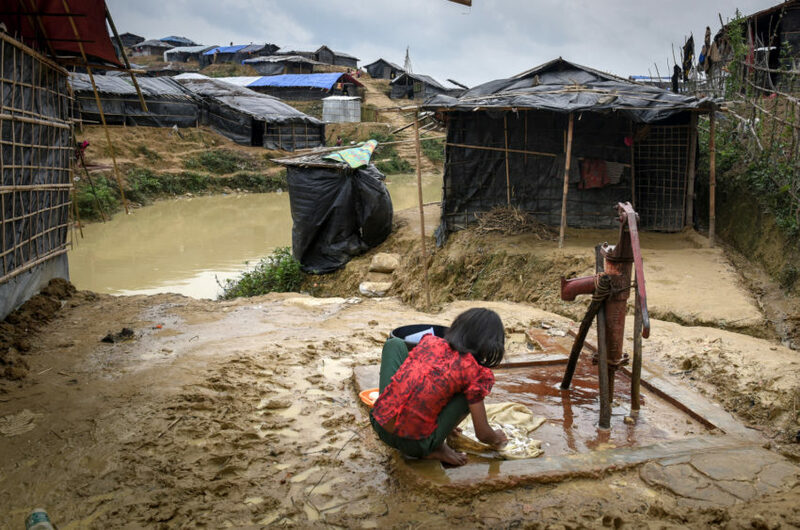 Less than three percent of refugees were immunized in Myanmar, so they are highly vulnerable to preventable diseases such as measles and diphtheria. 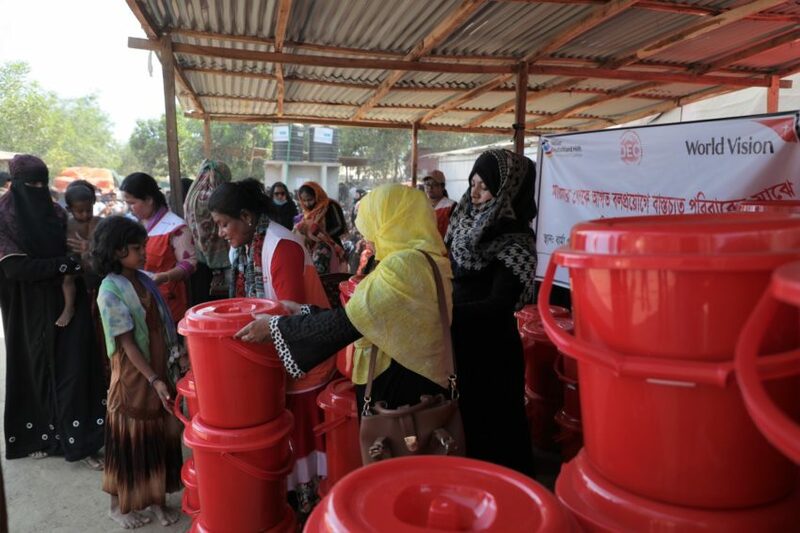 Families receive basic food supplies from U.N. agencies and humanitarian organizations, and refugee families in Bangladesh need about 12,200 metric tons of food each month. Basic food distributions include rice, lentils, and oil. It is difficult to eat the same thing day in and day out, but families don’t have the money to buy fresh fruit and vegetables to supplement their diets. Another reality of refugees’ living conditions is sexual violence. Almost every woman and girl in the Balukhali settlements, which include about 65 percent of the refugee population, is a witness or survivor of sexual violence. Hundreds of incidents are reported weekly. Women and girls need support for mental health as well as physical health and security. Lack of protection: Thousands of children are separated from their parents or primary caregivers. 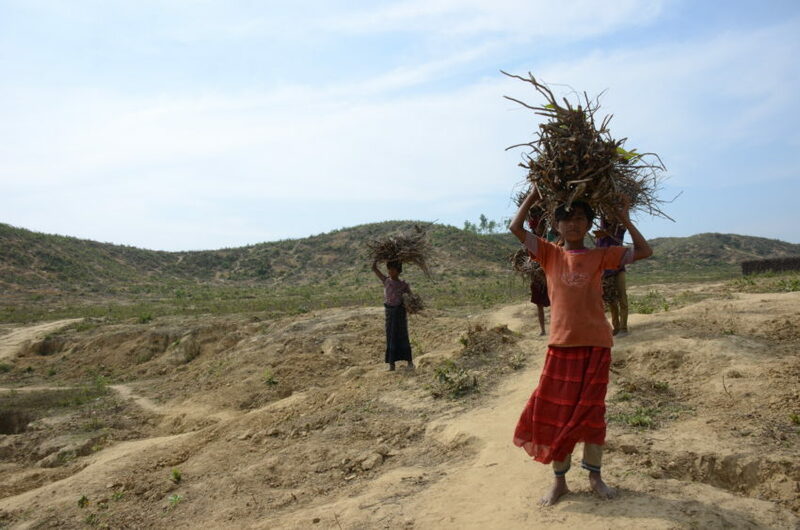 Both girls and boys face unsafe conditions as child laborers, most often gathering firewood or in domestic service. Extreme poverty makes them more vulnerable. Disease outbreaks: The World Health Organization has reported outbreaks of measles, diphtheria, diarrhea, and respiratory infections among children under age 5. Gender-based violence: Girls are vulnerable to violence, especially as refugees from Myanmar have no legal status in Bangladesh. Many suffer from neglect, abuse, exploitation, or sexual violence and resort to negative methods of coping, including child labor and child marriage. Lack of schooling: Refugees are not allowed to enroll in local education facilities. Child laborers, children with disabilities, girls, and children in women-headed households also face barriers to attending educational programs for refugees. About 98 percent of refugee children and adolescents aged 15 to 24 years are not accessing education. 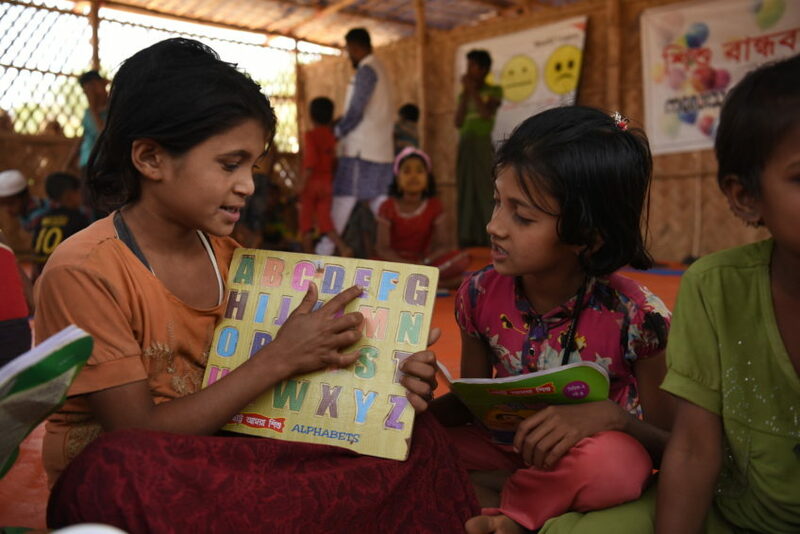 For more information, read “Childhood Interrupted: Children’s Voices from the Rohingya Refugee Crisis,” a joint report from World Vision and other humanitarian organizations, based on consultation with children and mothers in Bangladesh refugee camps and host communities. World Vision has served in Bangladesh since 1970. Early efforts mainly focused on disaster response following a cyclone in the coastal regions. Today, World Vision directly reaches about 5 million children and adults through sponsorship and other programs. In Myanmar, World Vision began operations in 1991. Child-focused programs help families with health, livelihoods, education and child protection, including reintegration support for trafficked returnees and released former child soldiers. 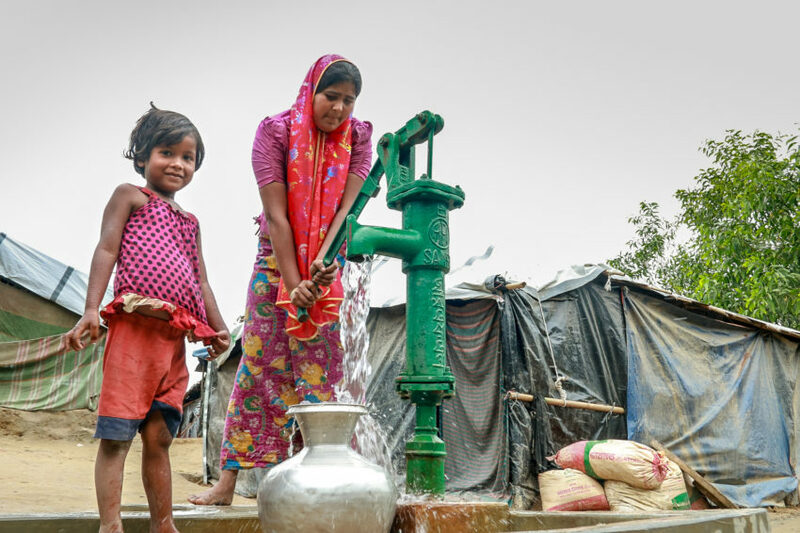 World Vision has served nearly 265,000 people in Bangladesh since the crisis began in September 2017. 1,720 children benefit from protection activities each week. 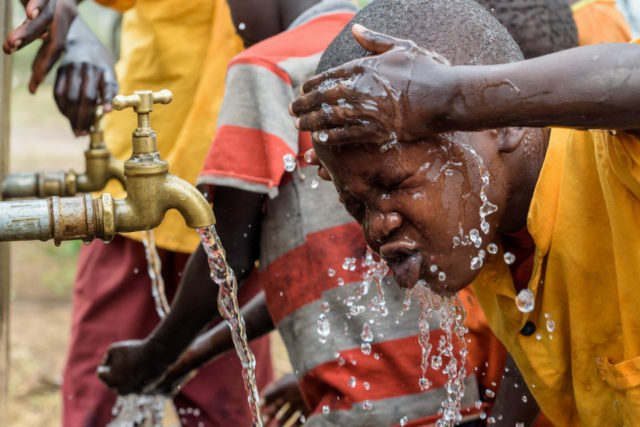 158,000 people were reached with clean water and sanitation facilities. More than 30,000 children and mothers are receiving nutrition support. More than 44,000 people have received upgraded shelter kits. 150,000 people received necessary items, including hygiene kits, cooking equipment, baby supplies, and feminine hygiene products. 22,500 people have taken part in cash-for-work programs. Chris Huber and Kathryn Reid of World Vision’s staff in the U.S. and Karen Homer of World Vision’s staff in Bangladesh contributed to this article. Bring hope to refugee children.